The Patio Company can turn any plain landscape into a dream oasis. With over 30 years of professional landscaping experience, The Patio Company is able to incorporate landscaping into each pool design. Most companies install a pool without considering the surroundings. The Patio Company works with the natural contours and details of any landscape and builds a swimming pool that stands out from the rest. From stone trimmed spas to extravagant waterfall swimming pools and more, The Patio Company’s pool designers can create the outdoor landscape of your dreams. Some of The Patio Company’s past projects include free form grottos, splash pools, diving rocks, spas, inground pools, gunite pools and more. Create your own tropical getaway with The Patio Company, one of the best pool companies in Newburyport, Massachusetts. Having a swimming pool installed is a great way to turn your backyard into your own private oasis. Stop hiding inside with the air conditioner during the hot season. Spending time with your friends and family outdoor with a pool to stay cool is a great way to spend your time. Inground gunite swimming pools are among some of the best for pool designs. 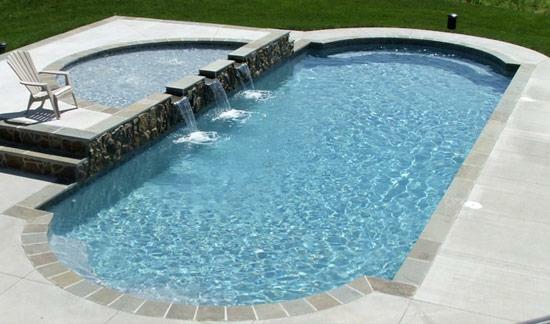 The Patio Company is able to create every style of pool in a variety of combinations. With several different types of finishes and shapes to choose from, its great to have a company that can do it all.